Mon Song Lyrics from bangla album JUJU. A Beautiful Song Sung By Anindya Chatterjee from Chandrabindu Bangla Band. 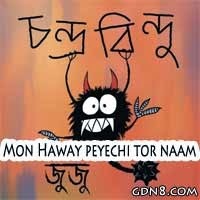 Dur deshe fikey howa raat..
Monre Ghumer gopone tomake abar daaklam..